Since I spend a lot of time working on sermons, I have some thoughts to share about the end-to-end process, in hopes that they will stimulate some good thinking by those who also work to prepare sermons (or may one day). 1. I know I have many superiors in this category, and that many of them employ different methods to one degree or another. 2. None of this is “secret sauce” which must be employed by everyone or which guarantees success. Still, these are methods employed by one man who has been doing this weekly for several years now, so I hope a review of this will help others think through their own preparations, whether or not the methods themselves are emulated. Does it even need to be said that sermon preparation should start with the Bible work? By “Bible work” I mean the direct study of the sermon text itself, and the related cross-references, as opposed to what others say about the sermon text. It is a great temptation to just skip to what Matthew Henry says (for instance), but this must be resisted. What quicker way can we imagine to quench the Spirit than an unhealthy – borderline idolatrous – reliance on men? Sermon preparation should begin with a quiet room and a Bible. The most important work in preparing a sound, expository sermon happens then. – Men’s Bible study. At Sovereign Redeemer, the men and boys who are willing and able meet for an hour on Monday morning to discuss the text that will be preached on the upcoming Sunday. Leading that discussion gets me into the text at the start of the week, and gives me exposure to the thoughts of a variety of men regarding the text. If there are particular interpretive challenges, I become aware of them right away. – Searching out the best cross-references. The most important principle of Bible interpretation (or hermeneutic) is that Scripture interprets Scripture. Other related texts of Scripture are always the best commentary on the sermon text, and always the best source of explanation for difficulties in the sermon text. Always. So, after reading the sermon text slowly several times, and earnestly seeking the Lord for help, this is where I start. I look up every cross-reference from four sources (three study Bibles and Matthew Poole) one by one, looking at each in context and considering the bearing of each on the sermon text. My guess is that 75% of the finished sermon comes from this exercise. I cannot stress enough how invaluable this step is. – Comparing translations. Years ago, at an expository preaching conference, Dr. Andy Davis gave a message in which he said that if a preacher hasn’t studied the original languages (Hebrew in the Old Testament, Greek in the New), the next best thing is a comparison of reliable English translations. At points of translational agreement, the English word uniformly selected by the translators is a close equivalent to the word in the original language. At points of translational variation, the underlying Hebrew or Greek word is worth researching. Having never studied Hebrew or Greek, this has been very valuable advice for me. I use Bible Gateway, an online tool which allows for side-by-side comparison of selected translations. Here is the link that I use, which compares NKJV, KJV, NASB, ESV, and NIV. – Looking at the original language. 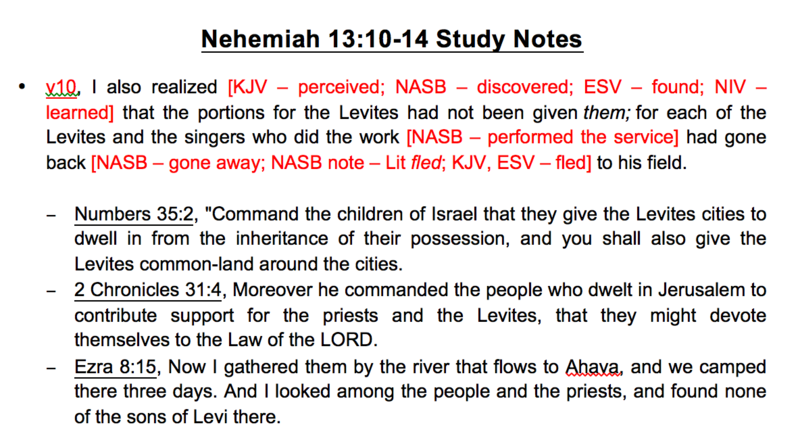 For very prominent, important words in the text, and for places where significant translational variation exists, I look at the Hebrew or Greek. 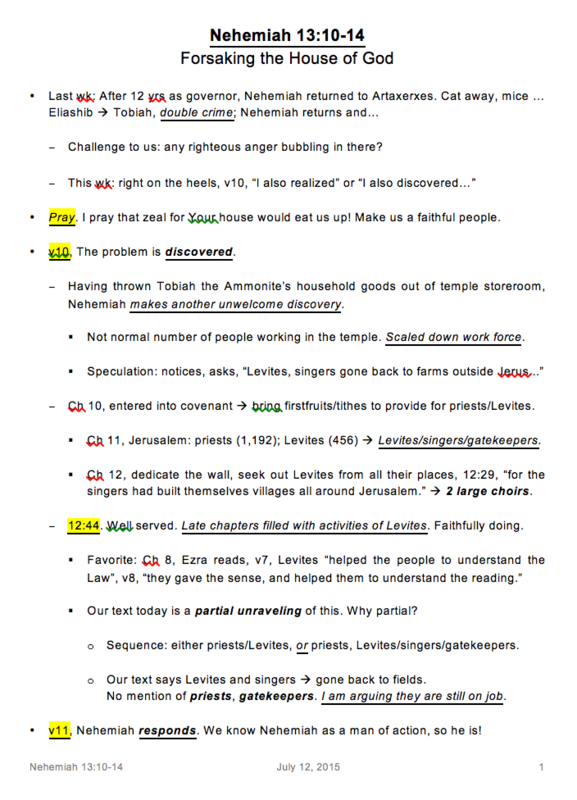 I use the online tool Blue Letter Bible. By entering the text, then selecting the verse, then selecting the Strong’s number for the word in question, a multitude of information is made available. Not only is information from the Lexicon very valuable, but the other places where the same word is used is displayed. Looking at the other usages of the same word is often pure gold. – Creating a basic outline. At this point I make a first attempt at creating a high level structure for the sermon. Having done the Bible work, I should have begun forming a view of how the text could or should be preached, and this forces me to begin articulating that. This first outline usually represents no more than fifteen minutes of scribbling on a legal pad, but it moves my thinking from what I am learning to how I might communicate what I am learning, which are vastly different things. If you want to see the whole file, you can access it here. I start by separating the verses of the sermon text, so that each verse of the sermon text begins a section of the material related to that verse. Within the verse of the sermon text, I note any translational variations and/or facts about the original language in brackets in red text. 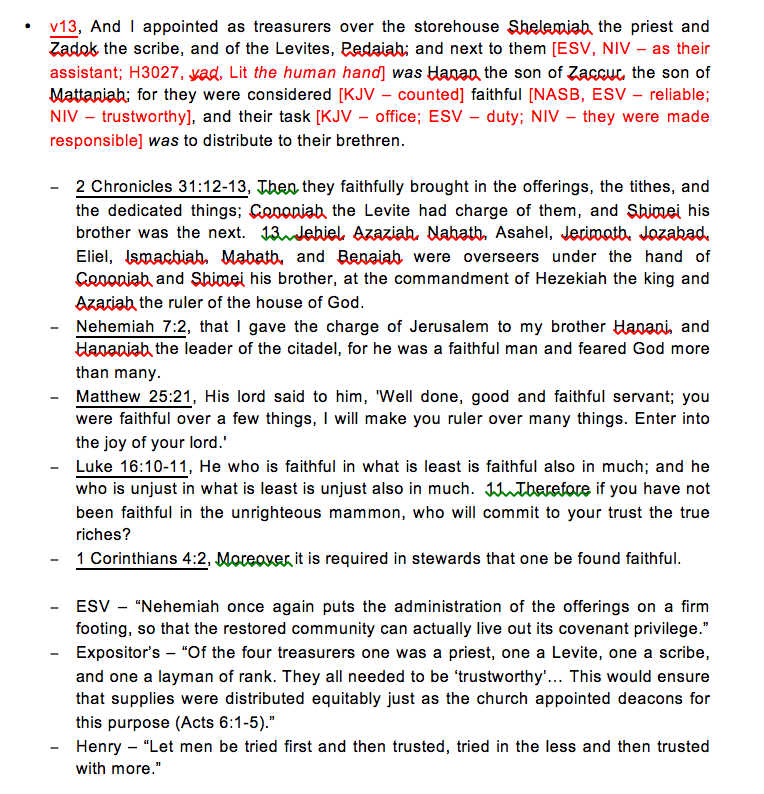 The cross-references are below each verse of the sermon text. On an average week, the Bible work requires 3-4 hours. As the week progresses and I continue to study, new material goes below the cross-references. * As a side note, fantastic Bible study tools exist that are not even referenced in this post. I have not invested in these yet, but I have no doubt of their tremendous value. If you are interested, here is a summary analysis of two of them. Once the Bible work has been given lavish attention, there is most certainly a place for consulting a variety of sources about the text. God has given tremendous insight to many Christians throughout the centuries, and we are well served to consult them, especially in areas of difficultly or controversy. Exclusively trusting our own insights is the height of arrogance and folly. Let’s divide our consideration into two categories: study Bibles and commentaries. I prefer to start by reading through the notes of multiple study Bibles, since the content in a study Bible is by nature limited and more high level. A study Bible helps unpack the meaning of a text without going into extreme detail, and when several are consulted, a number of different perspectives emerge. Nelson’s NKJV Study Bible. My Nelson is the most basic of the four, and I don’t mean that in a negative way at all. It consistently provides straightforward, right-down-the-middle explanations, which is a great way to start the extended study of any Scripture text. The ESV Study Bible. This one is probably my favorite, though not making the others dispensable by any stretch. I do love the maps and pictures which are sprinkled throughout. The MacArthur Study Bible. Compiled by arguably the best Bible expositor of our lifetime, I almost always find something extremely valuable in these notes. I wouldn’t think of not consulting Dr. MacArthur’s notes during my preparations. The Reformation Heritage KJV Study Bible. Released in 2014, this offering by Joel Beeke and team is a welcome addition. The notes are the most consistently Reformed of the four, and I normally benefit from the “Thoughts for Personal/Family Worship” section which concludes every chapter. At the time of this post, all four of these study Bibles can be acquired for a total of just in excess of $100, so the costs aren’t prohibitive at all. The genius of these four study Bibles is found in the distinctions. They are different enough to all be indispensable in the grouping. The last thing a studying pastor should want is to sequester himself in an echo chamber with only sources which never contradict his own inclinations. Having a diversity of sources with at least slightly different perspectives is beyond a good idea. It is safe. And beginning with these more limited, summary level sources actually helps me to be ready for what comes next. After having gotten my feet wet, so speak, with the study Bibles, more comprehensive commentaries then provide greater depth and breadth. They provide more information and more fully treat the difficulties and controversies in the text. The Expositor’s Bible Commentary. At the time of this post, this hardcover set (13 volumes; 8 Old Testament plus 5 New Testament) costs in excess of $550, so this is a significant investment, but there are two things I love about this set. First, it is reliably reliable. It has a wealth of information, and the viewpoints advanced are consistently sound. Secondly, it is very broad, providing visibility to even unsound viewpoints and scholarship, though only advancing what is sound. As a preacher, I need to be aware of the false interpretations being advanced by professing Christian scholars, so that I can proactively teach against these false doctrines when necessary. This commentary set also makes me aware of modern scholarship, since my preferred commentators are normally brothers from bygone centuries. Matthew Poole. Several years ago I stumbled across a quote from J.C. Ryle, my favorite author, where he commended Matthew Poole as the preeminent English Bible commentator. Since Poole was the favorite of my favorite, I said, “I have to get that!” And I haven’t been disappointed. Matthew Poole is rigidly exegetical, sticking to commenting on the words of the text, and articulately concise, getting to the point and saying it well in an amazingly few words. If you only had 15 minutest to prepare a sermon, you would want to read Poole. At a current cost of $40 for the 3-volume set, buying it makes you the big winner. Matthew Henry. Is anyone more quotable than Matthew Henry? I doubt it… If you are looking for incredible insight, said in a memorable way, look no further. At a current cost of about $55 for the 3-volume set, owning Henry is essential. On the weeks when I wonder if I’ll have the time to read all of my commentaries, I always scratch out the time to consult Matthew Henry. Various and sundry. Some of the most helpful insight on a book of the Bible is not part of a Genesis-to-Revelation set. For instance, when our church was studying 1 Peter, my most beloved commentary for that became this one by Robert Leighton, which is a one-off book on just 1 Peter, not part of any set. Suggestion: Google “the best commentary for the book of _______” (fill in the blank). A number of ranking lists will pop up, and by comparing a few of them from sources you recognize and trust, you will find some great resources. Ligonier (R.C. Sproul and team) and Tim Challies often have helpful rankings, as does the aptly named bestcommentaries.com. If we only use commentary sets, we will be missing some of the best available content. On an average week, this represents 3-5 hours of work. At this point in the process, the reading I intended to do is complete. The Bible work is done, the study Bibles perused, the commentaries considered. Now I have an orderly and sometimes hefty study file. The earlier in the week I can reach this point the better. I like to have a few days in this condition before I start writing. Whether consciously or not – sometimes I am purposefully thinking about it, often not – I am percolating on the information and turning the sermon text over in my mind again and again. Constructing a sound, expository sermon is more than picking out the particularly quotable nuggets from the experts and stringing them together in an organized way. It involves thinking. A lot of thinking. Either the day I write the sermon, or preferably the day before, I print out my study file and read through it, making notes, highlighting the most significant portions, and starring the parts I want to make sure to use. By the end, that pack of papers is almost always a mess, and that’s how I like it! Working back through my study file in this way usually requires 1 hour. Now I am ready to write. A daunting task: writing a sound, expository sermon to be delivered to the Lord’s people. That’s why it’s so daunting. They are His people. He bought them with His own blood. It is His word. He gave it as a good gift, without a jot or tittle of imperfection. And yet it is also exhilarating work, where so often the preacher can sense being helped in a unique way. I write the sermon with an open Bible and a keyboard. Yes, I have a detailed, multi-page study file, but I set it aside. I refer to it at the end, to make sure I haven’t missed something I really wanted to include, but I don’t want to be directed by it in the sermon writing process. I want to prayerfully pour over the sermon text and work to express what I’ve learned in a clear, compelling way. I limit myself to three pages. Three and only three, with virtually no exceptions. I have backed down to that from double that number over the past four years, but I am very committed to this limitation, at least for now. That means I am preaching from a skeleton, trusting that the flesh is in my head and ready for use. That means I am working from words and phrases, not sentences and paragraphs. I find myself freer in my preaching taking this approach. I generally use the same format. The format is this: introduction, including a quick review of the preceding text, prayer, a careful exposition of clearly delineated subsections of the text, then applications. I am very systematic when I preach. You can tell I am preaching from an outline. Engineers usually like it. Artists not so much. I am conscious of finding Jesus in the text. Since Jesus is the ultimate fulfillment of the promises and prophecies of Scripture, and the ultimate source of life for all the people of God, I always try to find the most direct path to Him from the sermon text – Old Testament or New. There are gratuitous and unsound ways to go about this, by the way, which encourage further misuse of Scripture by the hearers, so I work hard not to stretch texts just to get to Christ. The sound paths to Jesus are more than sufficient. I try my best to stay focused on the main point of the text. I am amazed at how easy it is to miss the mark on this – and how many times I have! When I was preparing to preach my first sermons, my mentor Scott Brown would ask me this question early in the week: “If you had to boil this text down to one irreducible sentence, what would it be?” We always need to have a good answer for that question, and then our hearers should be able to give that answer at the end of the sermon. I work to come up with a very fitting title. The title matters. I used to think otherwise, but I have definitely changed my mind. This goes back to having the main point crystal clear in my mind, and being able to boil the text down to the most critical essentials. I know I have a good title when it makes sense to refer to it a couple of times during the sermon. With a not-so-good title, there won’t be much point in referring to it after the first 30 seconds of the sermon. Most of these have little or no theological importance, and I’m confident there are better preachers who use very different approaches. Again, I offer what I do to stimulate thought. On an average week, writing the sermon requires 3-4 hours of work. Early Sunday mornings, after the sermon is completely written, I print it and go back over it thoroughly, making additional hand-written notes and highlighting certain places to draw my attention to them as I preach. On an average week, this represents 1 hour of work. For those keeping track, that brings my total time to prepare a sermon to a range of 11-15 hours. The entire file is accessible here. Here are some additional thoughts related to actually delivering the sermon. Position of the sermon notes makes a difference. I find myself less tied to my notes and more able to make eye contact if I have my notes elevated and tilted at a good angle. It sounds silly, but for me this makes a big difference. There are enough challenges with sermon delivery without having to crane my neck to see my notes. There are ways to make sermon notes “preaching friendly”. I make the font big (for me, 12 point Arial, but whatever). Sentences are bad, at least long ones, and short bullets are good. I maintain generous spacing to make it easier to find my place. I use as many visual cues as I can think of: colors (sparingly), bold, italics, underlining, and highlighting. Urgent appeals are an essential part of preaching. If there is no urgent appeal to be made, then I shouldn’t be preaching. Preaching is fundamentally about proclaiming the word of God so that people change and make progress, and that requires urgently appealing for change. Done well, an urgent appeal is accompanied by a marked difference in intensity. Obviously if this is too frequent, it loses its significance. I normally identify one or two spots where I think an urgent appeal is appropriate, or where a particular point should be made more forcefully, and then I increase my intensity markedly in those places. God loves His people. Paul says this to the Ephesian elders: “Therefore take heed to yourselves and to all the flock, among which the Holy Spirit has made you overseers, to shepherd the church of God which He purchased with His own blood.” (Acts 20:28). However much or little confidence I have in any given sermon, I always go into the pulpit with the full assurance that God loves His people and will help them to be well fed. If you have the time and inclination, print out the sermon notes and listen to the sermon with those in hand. I hope you find it to be a sound, expository sermon, and that this series of posts helps you grow in your ability to prepare and deliver the same. Having preached most Sundays for the last four years, I know this is true. You can listen to my early sermons and my later sermons and tell that I have more building blocks at my disposal now than I did then. Every week that a text of Scripture is studied to the depth required to give a faithful exposition, so much is learned, so many connections in Scripture are uncovered, so many applications are considered. And this accumulates week by week, and all things being equal, causes a preacher’s sermons to have more depth and breadth over time. – Preaching rotations have their “cons”. There are some “pros” to ongoing preaching rotations, but a definite disadvantage is that each preacher gains less building blocks. Any preacher will tell you that only a fraction of what is learned in preparing to preach a sermon can possibly be learned in the hearing of it. The preparation for a sermon might easily consume ten to fifteen intensely focused hours, while the hearing of it rarely exceeds a partially focused one. When one man has the primary responsibility to preach sequentially through a book of the Bible, he has the definite advantage of acquiring building blocks all along the way, and building blocks that are closely related to upcoming sermons at that. For each new sermon, he is reaching back and pulling forward things learned in the preceding weeks and months. – Church planting multiplies this effect. When Hope Baptist planted Sovereign Redeemer over four years ago, the number of men who were acquiring a new building block each week doubled from one to two. What is the value of that over time and many church plants? Priceless. That is the tragedy of short-circuiting that effect through satellite campuses which pipe in preaching over the jumbotron. Depth which could have been added to the Lord’s people is lost, and we become more dependent on personality and the most gifted communicators. Don’t get me wrong. There is no virtue in bad preaching, and we should praise God for gifted communicators if they are also leading godly lives, but the sound preaching of a truly local shepherd is to be preferred to John Piper on the jumbotron every time. I hope these thoughts are useful, and may the Lord put His hand on us as we labor among His precious people.